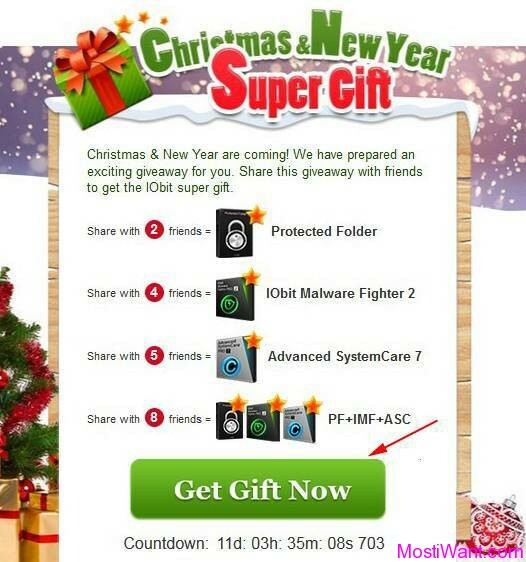 IObit has launched a Christmas & New Year Giveaway promotion on their Facebook Page in a bid to express their gratitude towards all customers. 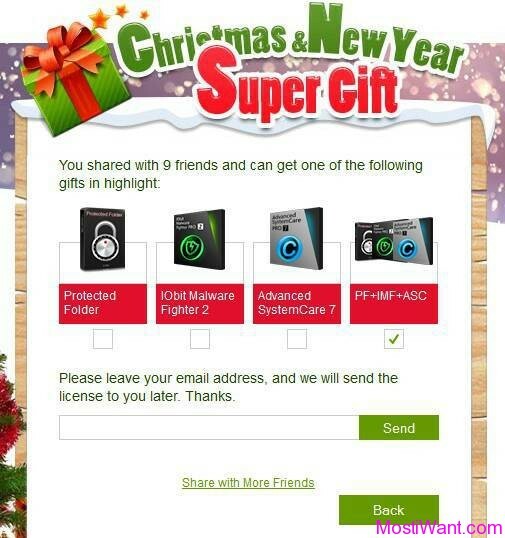 You just need to share this giveaway activity with your friends and then you can get gifts of 6 months full version software from IObit including IObit Advanced SystemCare 7, IObit Malware Fighter 2, and IObit Protected Folder. 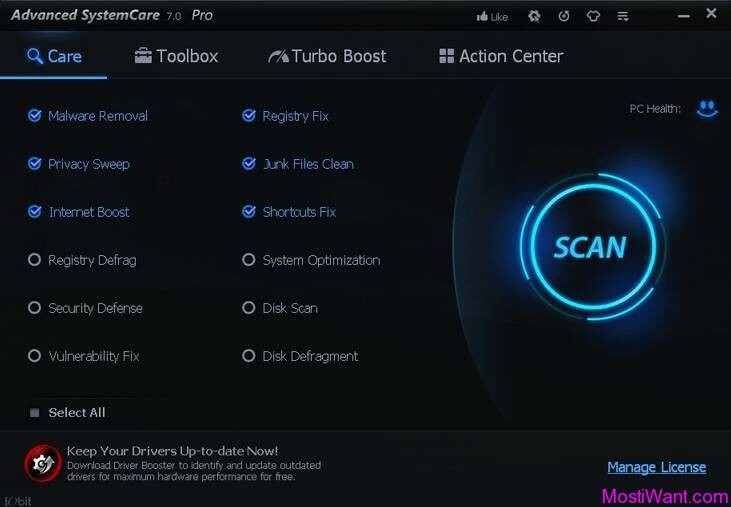 IObit Advanced SystemCare Pro is an easy-to-use, intelligent and powerful PC maintenance and optimization suites which provides an always-on, automated, all-in-one PC Healthcare Service with anti-spyware, privacy protection, performance tune-ups, and system cleaning capabilities. Brand new user interface for easier and smoother use. AutoClean is available in FREE edition now for intelligent privacy protection and system cleaning. New Surfing Protection technology supports real-time database update and parent control for safer surfing for both parents and kids. 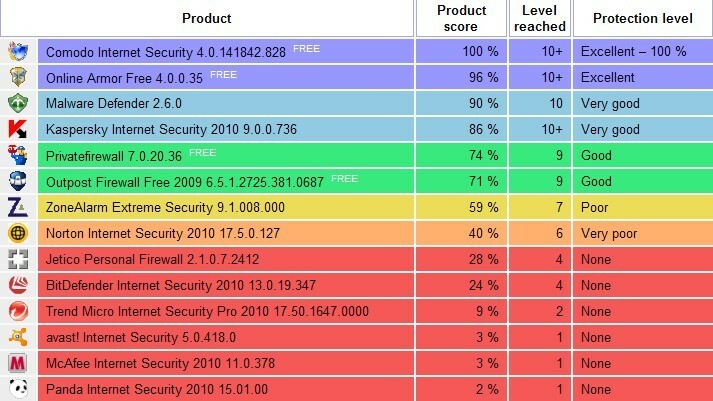 New Homepage Protection function protects homepage and search engine against malicious modification. New Program Deactivator tool for retrieving more available system resource by disabling running programs. New Skip-UAC function for faster and easier loading of the program. Fully upgraded Cloned Files Scanner supports removing duplicates in just one-click. Expanded Malware Removal database for better protection against latest malware threats. Enhanced Registry Fix and Vulnerability Fix for faster scanning speed and stable performance. Enhanced Shortcut Fixer provides faster scanning speed and richer functions. Improved Junk Files Clean fully supports the cleaning of Windows 8 Metro (Modern) Apps. Improved Disk Explorer supports removing useless downloaded files by scanning download directories. Improved Turbo Boost gives you more stable performance and advanced custom configuration. IObit Malware Fighter 2 is an advanced malware & spyware removal utility that detects and removes the deepest infections. 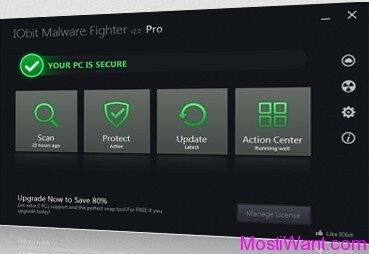 Malware Fighter has a enhanced real-time protection that protect your PC from various types of spyware, adware, trojans, keyloggers, bots, worms, hijackers, and other security-related risks. IObit Protected Folder is a folder / file locker that is designed to password-protect your folders and files from being seen, read or modified in Windows 8, Windows 7, Vista, XP and Server 2008, 2003. It works like a safety box, just drag and drop the folders or files you want to hide or protect into Protected Folder, then no one can see, read or modify them. 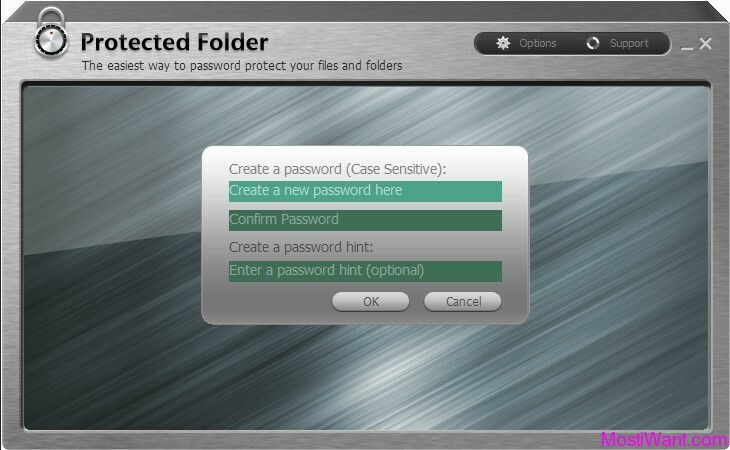 Whether you are concerned with privacy, data theft, data loss, or data leaks, Protected Folder is an ideal tool for you. Note: It is critical that you don’t forget your password, because IObit won’t store it and won’t be able to retrieve it for you. Christmas & New Year are coming! IObit team have prepared an exciting giveaway for you. Share this giveaway with friends to get the IObit super gift. 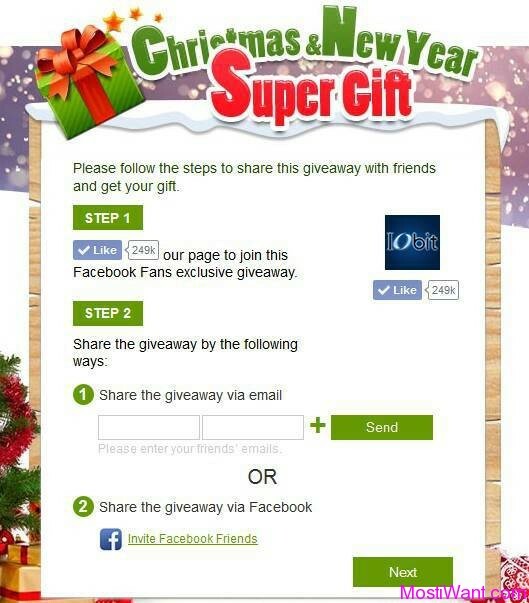 Step 1: Go to IObit Christmas & New Year Giveaway page on Facebook and you will be asked to press OK two times to allow the “Christmas & New Year” app (I press skip and the offer still works for me). Step 3: Click on the “Get Gift Now” button. Step 4: You will be redirected to a detailed page. Choose the way to share this giveaway: Email, or Facebook. You just need to sent you invitation and it does not require your friend to confirm your invitation. After share the giveaway click on the next button. Giveaway license code is valid for 6 months and you need to active it before 1/10/2014. More info on the promo page here. Follow IObit on Google + and and receive your PC maintenance software gift worth $29.95. Giveaway begins from December 23, 2013 at 00:00am PST to December 26 at 00:00am PST. More on the promo page here. Thanks to Marisa from IObit for informing me about this promo. Thanks a lot for the keys, regards Jan.
guys if you have got old licence key like the offer on 30 oct.2013 you just enter today’s licence key . And you got 1 yr. Very good William. No facebook here either. Oh well. Merry Christmas to all. Dear Joey, Sorry for the delayed response to your comment. Since you do not have Facebook account, I have got all the licenses for you. Please check your email for it. Wish you and yours a happy holiday season and a happy New Year! I do not have either facebook, still a Merry Christmas to everyone on this site. Dear jan, Sorry for the delayed response to your comment. Since you do not have Facebook account, I have got all the licenses for you. Please check your email for it. Wish you and yours a happy holiday season and a happy New Year! Don’t worry. I have got the licenses for you. Please check your email for it. Merry Christmas & Happy New Year!